Only units sold by authorized Sirena dealers are covered under the manufacturers warranty. Please check our dealer locator (www.sirenasystem.com/find-a-dealer) or contact us to verify you are purchasing from an authorized dealer. THERE ARE A LARGE NUMBER OF ONLINE DEALERS MISREPRESENTING OUR MANUFACTURER WARRANTY ONLY UNITS SOLD BY OUR AUTHORIZED DEALERS WILL BE COVERED BY THE MANUFACTURER WARRANTY. Sirena uses Mother Nature’s most powerful element, water, to trap dirt and odors, returning only naturally clean, water-washed air to your home environment. With quiet mode you can wash your air with a very reduced noise and with the high speed has the power to tackle your toughest cleaning jobs. Sirena follows you from room-to-room on its easy-maneuvering dolly. Dirt, pet hair and crumbs vanish in the Power Nozzle’s powerful revolving brush. Very easy to use and powerful to remove the dust mites from on your mattresses. Cleans all types of surfaces such as Carpeting, Carpets, Tile, Linoleum, Parquet and other hard surfaces fabulously. WATER NEVER CLOGS THE WAY. SIRENA CLEANS 100% OF THE TIME – AT 100% EFFICIENCY. Connect with the Extension Wand. 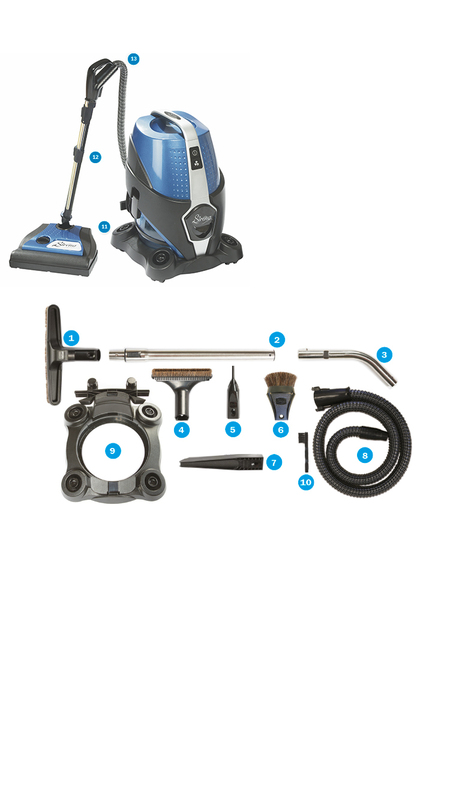 For detailed cleaning of extra difficult-to-reach areas, use the confined-space cleaner. The Sirena inflator tool works great for quickly inflating air mattresses and other inflatable toys. Bring along your most used tools to have all the attachment handy. This is a powerful electric tool to remove dirty, dust and dust mites from your carpets and mattresses but it is also excellent for the cleaning of all types of surfaces such as wood, tile, linoleum etc. Deeply embedded dirt can reduce the life and vibrancy of fabric. The Sirena Upholstery Tool effectively removes dirt from upholstered furniture. Use the Wet Pick Up Hose to suction the water and connect it with the curved wand to use the other tools. Use this tool to remove and clean the separator. You can connect it with the Power Nozzle or with the other extension wand to reach very high points. Connect with Floor & Wall Brush or other tools and extend it to reach the farthest points. You can connect it with the tools for the Power Nozzle or with the other tools. Not for wet use. When dirt and dust pass through a bag or filter, they can clog the holes that allow air to flow through them. Filters have to be replaced regularly, and still send germs, bacteria and dust back into the air you breathe. Sufferers of breathing disorders are especially vulnerable. This can make any vacuum very expensive over time. Systems with collection bins still rely on filters to catch particles of dust and dirt that escape from the bin. These clog just like any other bag or filter. One of the most common causes of skin itching at night is the presence of dust mites in the mattress. Dust mites are small insects that live like parasites, feeding on the scales that the skin releases. This type of arachnid prefers dark places with a certain humidity, so places like the mattress are ideal for them. For most people their presence is not even noticed, however if you have sensitive skin or have allergies to these insects, it is very likely that when you lie down in bed you start to feel pain and itching, as well as presenting dermatitis as a consequence of allergic reaction. Other symptoms may include sneezing, stuffy nose, cough or difficulty breathing. What does allergy produce to pets? Although many believe that people are allergic to the animals fur, the truth is that the element that produces this condition are some proteins present in saliva, hairs or urine of the same. These proteins are released from the skin or are dried, pulverized and transmitted through the air in the form of very small dust particles that gradually contaminate the inside of the houses. Therefore, the longer the stay in the animal's home, the higher the percentage of these allergens, the greater the chance of coming into contact with the eyes or the respiratory tract of the owners, causing an allergic reaction. Hair can also cause allergies, but less often as they are deposited on the floor and do not remain in the environment. The symptoms of allergy to pets are: rhinitis (sneezing, nasal itching, liquid mucus), which may or may not be associated with conjunctivitis (redness, whining, itching eyes, etc.). Furthermore, the allergic reaction can cause asthma (bronchial spasm and difficulty breathing, with cough, chest phlegm ...) causing hives (urticaria), angioedema (swelling of various parts of the body), generalized dermatitis or anaphylaxis (severe reactions with attack on various organs or parts of the body, with blood pressure or shock). With over twenty-five years of experience in the vacuum cleaner industry, our CEO and founder knew there were differents types of vacuum cleaners available. The most efficient and reliable were water-based cleaning systems. Wanting to make a high quality system with an affordable price, he puts his experience to work.The result is SIRENA; a "Total Home Cleaning System" of high quality with an Italian motor and Canadian engineering, developed with water filter and molecular separator to get the best air quality of our domestic environment, finally available with with the best price for all the families. 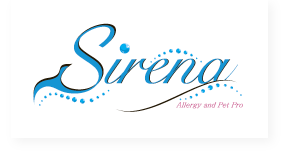 SIRENA is recommended for people who suffer from "allergies and asthma". The best solution for pet hair. Recommended for the best international certification institutes. T. Khayrallah, Founder and CEO, Sirena Inc. Introducing the latest addition to the Sirena family. The Turbo Brush is an air driven accessory that makes upholstery, stairs and even cars a breeze to clean. No electrical connection required as Sirena has plenty of power to drive this mini power head. This German-made Turbo Brush is an excellent tool to use where the regular power nozzle can't fit. Fill the form and send your informations. Our operators will reply you as soon as possible. To download a Sirena User Manual, first select the model desired. All manuals are in PDF format. You also can look Video Instructions. Pour télécharger un manuel d'utilisateur Sirena, sélectionnez le modèle désiré. Tous les manuels sont en format PDF. Vous pouvez également voir les instructions vidéo. لتحميل دليل المستخدم صفارة الإنذار، حدد القالب المطلوب. جميع الأدلة هي في شكل PDF. To see how the Sirena can meet your specific cleaning needs, we invite you to see it in your home. Just fill out the form below and we’ll send the information to an Authorized Distributor in your area. For immediate assistance, please contact your local Authorized Sirena distributor. If you have questions about any Sirena product, please contact Sirena Europe Customer Service Department. They will provide you with the answers you need, or will direct you to a local Authorized Sirena Distributor who can help you get the information you need. Para descargar un manual de usuario Sirena, seleccione el idioma que desee. Todos los manuales están en formato PDF. También puede ver las instrucciones de vídeo.